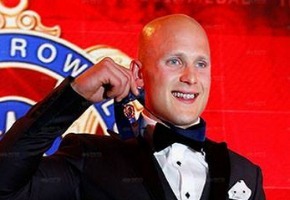 Rival TV networks know Brownlow Medal night is a losing battle and Gary Ablett’s win was no different. The ceremony pulled 930,000 viewers with 593,000 of those in Melbourne alone. Seven ran split schedules across the 5 cities but ended up with a huge 37.1% network share. For other networks it was really just a question of how they coped against big numbers. Nine’s Big Brother performed well at 932,000 and topping the demos. But TEN had an awful night with two of its big local production ranking lower than The Bold and The Beautiful. While Wanted wraps on Thursday night, A League of their Own (unbelievably scheduled against the Brownlow) will need to lift by next week or move to a weekend slot. Nine network was second with 26.1%, then ABC 18.8%, TEN 13.8% and SBS 4.2%. Seven News (1.32m) topped the night for Seven followed by Brownlow Medal (930,000 / 683,000 in 3 cities), Today Tonight (855,000), Home and Away (713,000), Million Dollar Minute (583,000), Highway Patrol (452,000 in 2 cities) and Movie: Quantum of Solace (379,000 in 3 cities). Nine News (1.21m) led Nine then A Current Affair (1.04m), Big Brother (932,000), The Amazing 80s (720,000), Hot Seat (579,000), Big Bang Theory (502,000 / 333,000). Two and a Half Men was 249,000 / 202,000. ABC News (914,000) topped ABC1 then Australian Story (833,000), 7:30 (815,000), Four Corners (579,000), Media Watch (559,000), Q & A (476,000) and Restoration Home (317,000). TEN had a tough night with TEN Eyewitness News (632,000), The Project (582,000). All its remaining titles fell behind The Bold and the Beautiful (428,000) being A League of their Own (403,000), Wanted (387,000) and The Simpsons (323,000). SBS ONE also struggled with its line-up. World News Australia was 200,000, Legally Brown was 179,000, From Scratch was 165,000 and Life, Death and Mistakes was 149,000. ABC2’s Florrie’s Dragons topped multichannels with 333,000. Neighbours on Eleven 332,000 beats The Simpsons on Ten 323,000…again! Strange how there was such a big drop between Seven News and Today Tonight compared to the drop between Nine News and ACA. Interesting battle between Hot Seat and MDM. Interesting to see that Seven has an episode of MDM due to screen this Saturday 6:30pm after the GF. The 2013 Brownlow Medal was Live and Free on 7Sport. It was a great night as usual. Although as usual the girls were board out of there skulls and i think they were too camera concious at the actual count. I cant see why they looked great, loved the gounds and the flowing dresses. Gary won again joins a very exclusive club to win on two seperate ocasions with two different clubs. I liked how they used past Brownlow Medal winners to present each round that was great. Overall the coverage was great, Bruce was at his knowledgable best, enjoyed Cameron Ling’s slight dig at Andrew Demitrou. Tonight the Final episode of Talking Footy Finals. I hope 7 bring this back full time next year or do this again for the finals next year really enjoyed it. Also i hope they do a Talking Footy Special on this Friday Night called That Was The Season That Was, loved that show back in the day. I have never watched and never will watch the Brownlow. Please tell me there is more than one award, like TV awards. Surely people are not sitting there enduring hours of boredom waiting for one award to be handed out (and a tiny one at that). Seven has thrown money at MDM as usual in a comp with Sunrise. I assume that would help the figures & it is Seven’s usual practice. I flipped through Wanted last night & watched briefly. It is just so dry in the delivery. I know it is a serious subject but they just need to somehow lighten the delivery style so it doesn’t feel like a lecture. @BigJMATHEWS – Um…on the Ratings page? @BigJMATHEWS: Fox Footy’s simulcast of Brownlow Medal count got 200,000, while its own red carpet special was watched by 107,000 nationally. Where are the FoxFooty ratings for there ratings last night? A League of their own is Destined for Cancellation. MDM may have won Monday, but has also dropped 228000 compared to the previous Monday. A League of Their Own wouldn’t be affected by the Brownlows in Sydney or Brisbane. And as it is probably already marked for death (they won’t want it as a lead-in for the premiere of Homeland) may as well send it over the top in the South than something else. Million dollar minute bettered hot seats last night. Still too early to see if it will be a new trend. iheartabc: Brownlow was on 7mate in Sydney and Brisbane, as is usual with Seven’s AFL coverage in those cities. Q&A was duller than dishwater last night. Was the Brownlow on 7? After 4 Corners and Media Watch, I watched some of the Brownlow on 7Mate and assumed something else was on the “main” channel.